From I-5 Northbound, Take the Sleater-Kinney Rd exit, EXIT 108, toward College St. Take the Sleater-Kinney Rd S exit, EXIT 108A. Keep left to take the ramp toward College St. Turn right on to Golf Club Road SE. Turn right into the South Puget Sound Community College Lacey Campus. 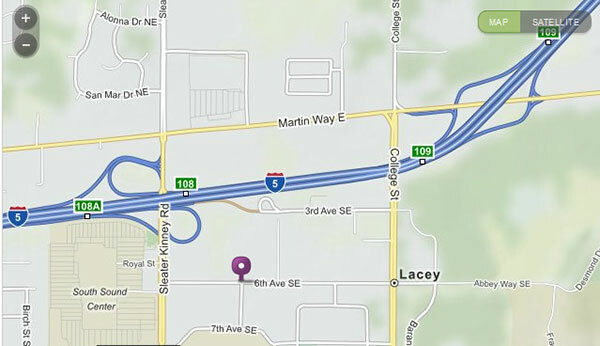 From I-5 Southbound, Take the Martin Way exit, EXIT 109, toward Sleater-Kinney Rd N. Turn right onto Martin Way E. Turn left onto College St SE. Turn right onto 6th Ave SE. Turn right into the South Puget Sound Community College Lacey Campus. Parking is free and located around all the buildings on the Lacey campus.